We are so excited about today’s feature with Jennifer Stables of Jenny Dale Designs. The characters she creates in her pieces are so adorable and each one has so much life and personality! We love that she takes the creativity to the next level by accompanying each piece with a poem that tells more about the character and makes for a unique addition to each purchase. 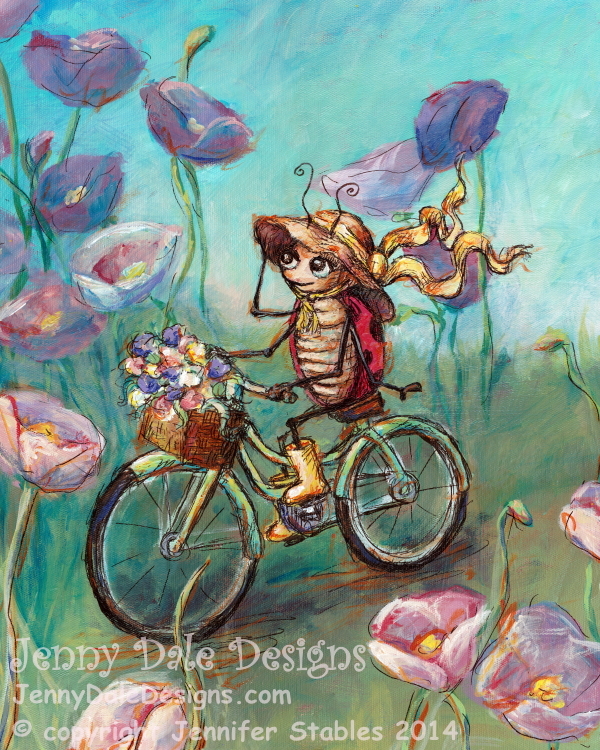 Although her art is amazing for a child’s room we still think a lot of these would be great on any wall! They would totally add a quirky touch to your desk space or reading nook. You can tell how much of herself Jennifer puts into these pieces and the happiness that her characters bring to so many people. Keep reading to hear about how she got her start and inspiration. : I am an artist, an educator, and a mother to two beautiful boys. I have a cat named Stretchy-Cat, I collect rocks, and I love Back to the Future. I grew up in a small prairie town called Bow Island, which has a population of about 1500 people. Currently I live in the town of Okotoks, Alberta, Canada (just south of Calgary, Alberta, Canada). I create artwork primarily for children’s rooms and nurseries and I write poetry to accompany each one. Art has always been a part of my life and I have been painting and drawing for as long as I can remember. I received my Bachelor of Fine Arts in 2001 and my Bachelor of Education in 2005 from the University of Calgary. 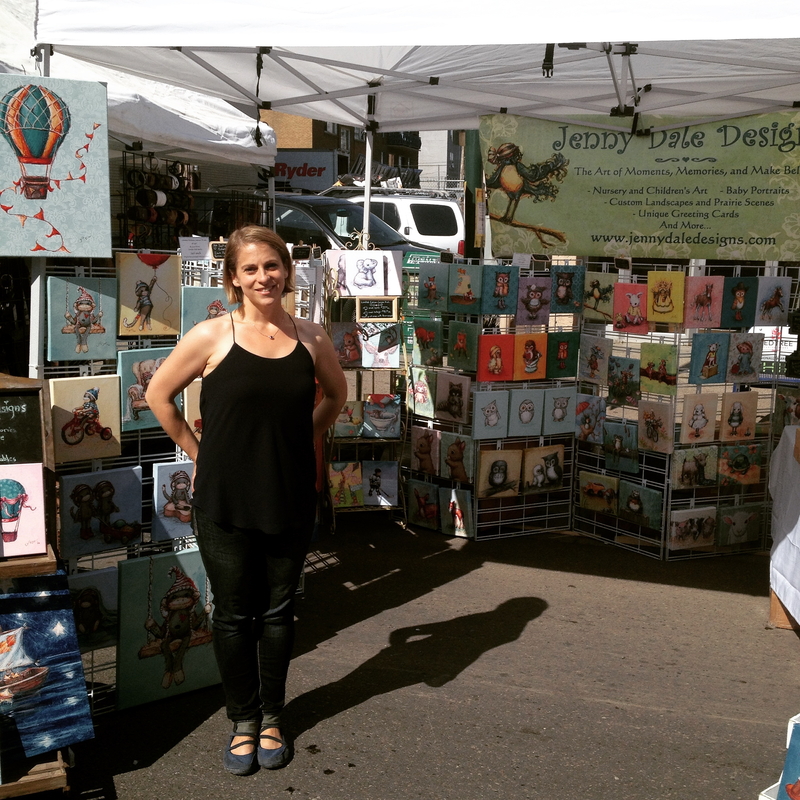 My artwork is sold worldwide through my business, Jenny Dale Designs, and through Oopsy Daisy Fine Art for Kids. 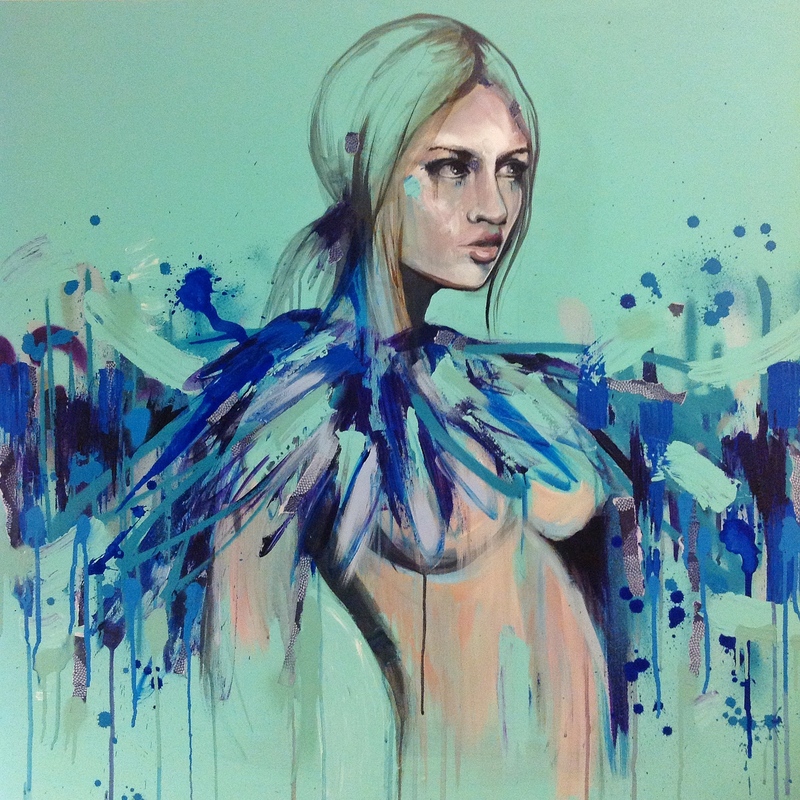 This week we’re featuring artist Sian Storey! Her creative journey is so exciting to follow and she has gained the attention of some major media outlets. We admire the fact that she is always seeking new experiences and ways to grow in her work. It reminds us of the Julia Child’s quote which says, “Find something you’re passionate about and stay tremendously interested in it.” It’s evident that Sian is living that out every day. 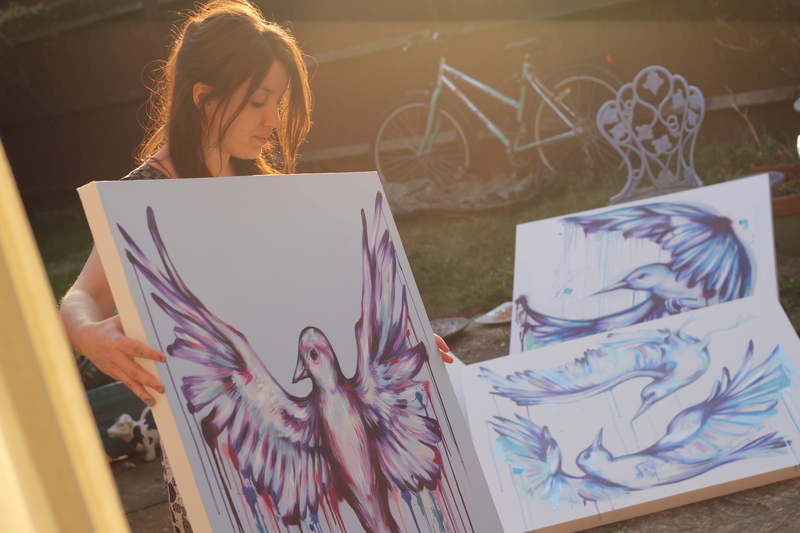 : Tell us about yourself and how Sian Storey Art got started. : Hello! 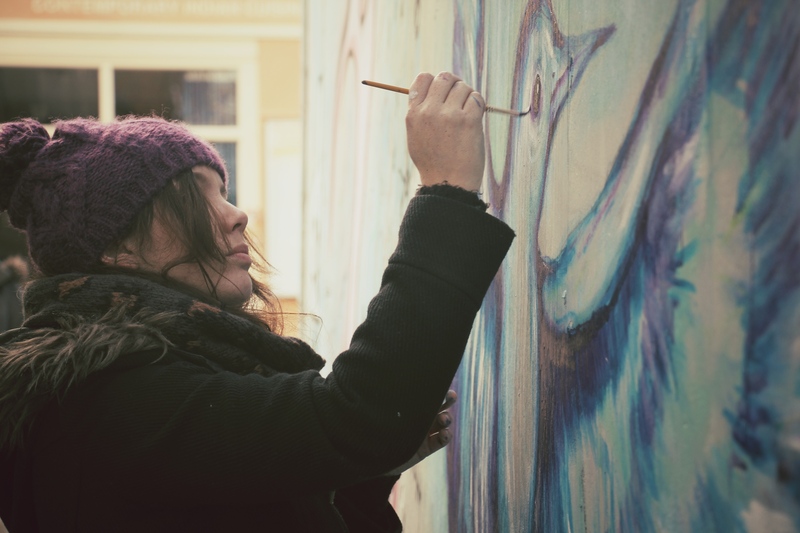 I’m an artist and art teacher in Hampshire, England. Painting is my passion, and I have a First Class Honours degree in Fine Art. As you’ll discover throughout this interview, I’m a versatile and hungry artist, always looking for fresh ways to evolve my art, and interesting new projects to be involved in. How did I get started? Let’s see… my earliest art memory is painting my Grandad’s gnomes in his garden back in the 1980’s. My Nan still has them 25 years on. So art has always been a big part of my life and was massively encouraged by my friends and family. It’s what I love, and something I will always do. : You mainly focus on people and birds. What made you decide to stick to these two subject matters? : I work from found images, and am particularly drawn to colour, pattern and beautiful pictures. I keep scrapbooks of images that I have collected and reference them in my paintings. I also love to travel, and this feeds into my work. Last summer I visited Japan, and have been referencing it in a lot of my work ever since. The people-based images I choose are often black and white allowing me to explore my own colour schemes. I like the image to feel emotionally charged, like the person depicted has a story to tell. Sometimes it’s my story, or just the way I’m feeling. I use birds in my work as they are also associated with literature and narrative, and they have many cultural references. I love creating movement in my bird paintings choosing colour to evoke mood, and texture to convey beauty. And sometimes, I combine both birds and people.